On the train, there are two screens. The scrolling LED—and the smart phone. I never see anyone looking at, much less paying attention to, the red, scrolling, digital one. As I look across the train, out of the eight people sitting comfortably in their seats, six of them are looking at and giving their attention to their smart phone. They don’t even look up to watch the sun peak through the clouds. Their heads are down, with their attention focused on their personal little screen that some people still call a phone. We are a captive audience here on the train, and no one wants to look at the scrolling digital sign. Clearly, they place no value in it. Is it because of the sign’s low-fi technology or the uninteresting content? Or is the smart phone simply too engaging to give attention to anything else? One person plays solitaire, another reads a book and one scrolls through their music. One of the most powerful aspects of that little personal screen: Users can essentially do anything they want to do on it. The experience is theirs, not a preconceived and served-up one. It’s the content they want as frequently as they want it. How can any other screen measure up? In the lobby, there are two screens. Out of four people waiting for the elevator, two look at the large news screen and two look at the mobile personal one. The ones looking at the large news screen are just filling time, half tuned in. And why not? After all, it’s the same recycled content that each of us has already heard earlier in the day. It’s too easy to simply pipe boring, meaningless, depressing content across other screens, outside of personal TVs and desktop computers. More screens, more places, right? They’re everywhere. The problem is “more content” is easily overlooked. As I ride up the elevator, no one speaks beyond, “Good mornings,” and “You doing OK?” After the pleasantries, the eyes turn back to the personal screen—that darn magnet. No. 3 is hardly sticky, but it is a reason to give your time to it. These factors are much easier to control on our personal screen. 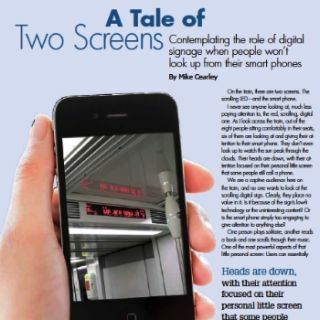 That begs the questions: What is the role of digital signage? And what can we expect them to really do? People, including me, say all the time, “people are on the move, now more than ever, so it’s important to hit them where they are, which is less in their living rooms and at a desk and more when they’re out and about, in the real world.” This is one of the profound opportunities of anyone in the digital signage business. I wonder if those same people ever think about the responsibility that comes along with that opportunity: the responsibility to not create more noise and distraction. We’re also in a time, now more than ever, where no one seems to experience boredom or lose themselves in thought. What happened to quiet time, in the auditory and visual sense? Is there even such a thing today? These screens are impacting behavior, and I have to wonder if it’s healthy. Is “all on, all the time” or any variation really a good thing for the human condition?